Model Trains Interactive :: View topic - British outline HO? that is it , thanks. I had a side photo so was reasonably happy, but will check against my design drawing. Might be a bit wide, is that width over whole length above wheels? I am thinking it might not quite fit. 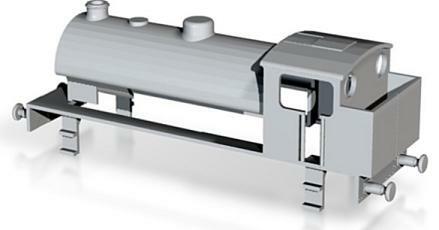 Other option is to use the Electrotren/Hornby chassis. The rear wheel is slightly too far back, but I could live with that. At least I have one of these so I can measure it properly. I eventually got chassis out of loco. The motor is 18mm wide, so still a problem. One way might be to cut rear off chassis, then move chassis back, so motor is in cab, then fit the axle in front. I am starting to see why HO for smaller locos is rare. Yes, it's basically a solid 'brick' under the bonnet, 18mm wide over the whole length. That's a pity if it won't fit, I could use an 'HO' Austerity tank. 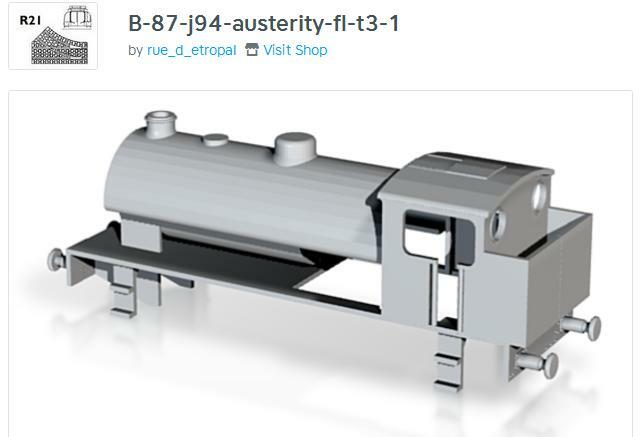 Branchlines do a replacement chassis kit for the Airfix/Dapol O4. 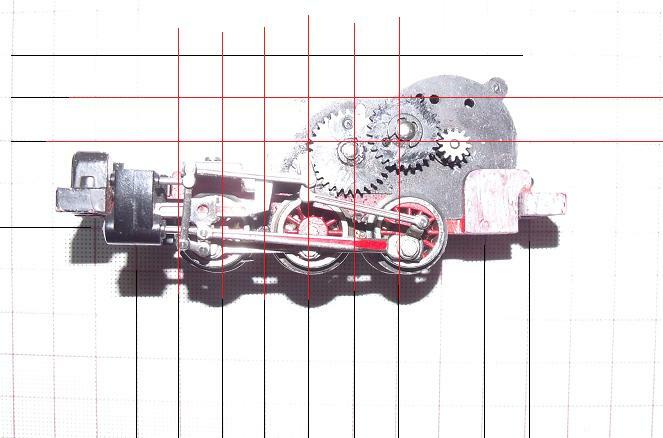 I don't have one to hand to actually measure, but looking at their motor/gearbox options in their recent catalogue, something like a Mashima 1420 motor and single stage gearbox would give you width of 14mm & height above rail around 30mm. plus with the chassis kit you can choose which axle to drive. I have had to look at many of the HO chassis for my narrow gauge, and found many have motors too high. Always seems odd for an HO loco. One other possible is the Liliput 060 fireless loco. 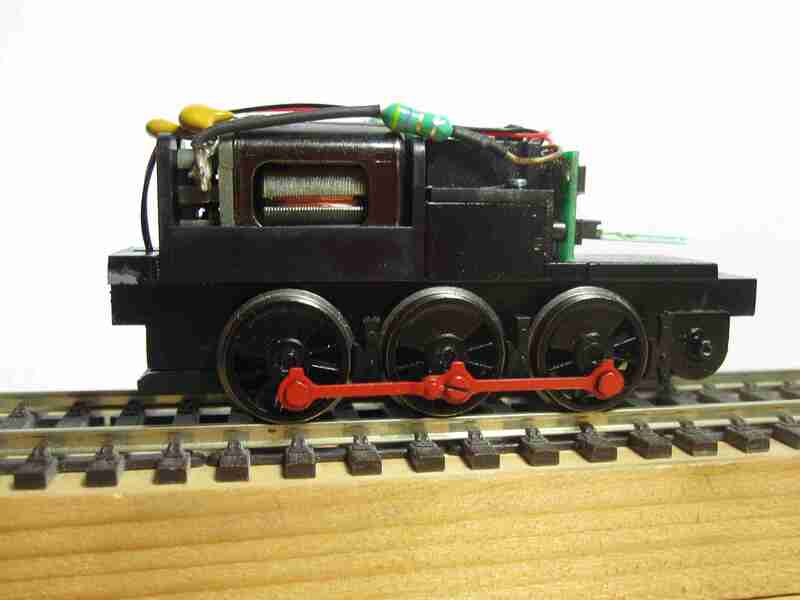 Not sure where Bachmann put motor though, as they quite often put it too far back. The smallest motors used seem to be about 18mm wide, but if turned b 90deg it is a lot less and would fit easily. Looked at cheap Mehano loco, with small wheels but the Scalectrix type motor upright in cab id too high. A bit ironical, given that Hornby replaced this motor with the smaller one on their small locos. A simple 060 chassis in HO would be popular. It would be possible to bodge up something, but don't really ant to do that myself. I have other HO locos to use for m project, so not vital to have a running austerity. It does not stop me making the model available, but probably with no cut out for motor, leaving it up to someone to decide. I would prefer to be able to use a r2r chassis as it is easier. One reason for producing model is to make British HO more tempting. Also 2 of these ran in France on Peugeot factory railway, even running on street track(I have seen photos). Just had another look at Fleischmann chassis. The motor would be in cab, no problem, and wheel base is correct. The gears on side might just fit under the saddle tank, and are only wide for a very short section. I might modify my model with an open base, certainly under cab. For interest I think it is the Fleischmann model of a T3 loco. Modified the 3D print design, The motor does not go too far forward. Should be able to hide it. I am hoping I might be able to make use of a screw fitting on chassis, forward of motor which hold valve gear assembly. It would mean a small hole in top of saddle tank, which could be plugged, and only dug out if needed. Rather than clutter the post, new one here. Found a decent side photo of Fleischmann loco. Chassis might have changed, as have seen some with a smaller motor. Advantage of these locos is lack of full length side tanks so chassis is more suited to a saddle tank. I overlaid my design over the photo. It really shows how much smaller British locos are. Especially given these two locos are both same wheelbase. I am pretty confident. The Fleischmann chassis run well, almost as good as modern ones. Some may not like the coarser wheels, but then the newer versions of the Fleischmann might have thinner wheels. You may already know about this, but MERCIAN models did make an HO kit of the Austerity. Their HO models were taken over by a Belgium Company http://www.pb-messingmodelbouw.com Other kits are of use are the Belgium Railways 4-4-0 type 17 a direct copy of a Caledonian Railway Locomotive, and an Armstrong-Whitworth Diesel Shunter (page 2 of motorstellung). thanks, have had a look, but could not see price. Also as a kit it would need building. A 3D printed body is less to do. 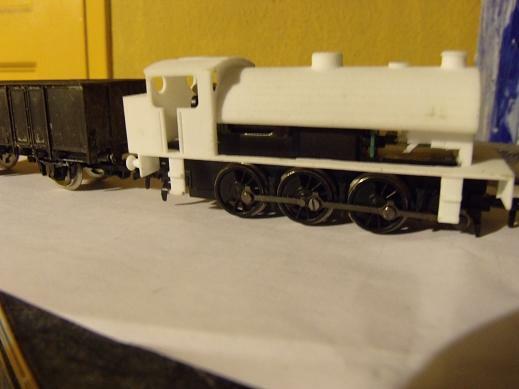 I estimate price for my 3D printed basic model ill be about £25 plus postage, and I can do variation, different cab, with and without buffers. I also can see the firebox under which helps hide motor. checking photos and some had attachments so making it easier to hide motor. One of the things I am trying to do is help those who don't feel confident to build , in particular metal, kits. Nothing wrong with them, but making hobby easier and at same time still retaining some modelling input is I feel important. Something some forget. British HO also needs as much help as can be supplied. Another point about kits, is that after a few years they disappear, for a variety of reasons. My 3D print designs will be around for a long time, or at least have potential to be around. No manufacture in advance. The Fleischmann models have been around for years,I think my chassis pre-date Mainline starting up, but it runs really well. Heavy metal chassis. I'm heartened to see quite a lively discussion on here about British H0! I've been a member of the society for many years. Sadly not been an active modeller in British outline for many years as I've been into US and European outline principally but I will be flying the flag for the society and the scale at the Leigh exhibition in September. My layout is called "Watlington" and was built by Mick Scarrow and friends, when he disposed of it a few years ago, I felt it was too valuable to potentially go to landfill so nabbed it! I've very slowly added to the available stock for it over the years but recently had to appeal for some British wagons as I had none suitable! The society worked for me in this instance so I would say it is worthwhile joining, it's FREE and of course, you can choose how much to interact with the Yahoo group. Hi, maybe will pop along to Leigh in September to have another chat. Had not realised you were interested in British HO as well. I think, if memory serves me correctly, that the Yahoo group is only visible to members. Although I can appreciate some might like to hide behind closed doors, specialist areas of our hobby need to be out in the open, or no-one new will be tempted. Interestingly having joined the 5.5mm/ft group, there has been a initiative to not only have a working and used Facebook page, but also a separate thread on RMweb, both of which have been successful in getting the group noticed. The British HO society webpage does not look up to date, so if there are items out there I can't see them. I am only interested in a small layout, something that will go in a suitcase so can be transported easily, and I can use some of my existing HO locos, as they are not too foreign looking. I would like some small wagons, even the Lima ones are getting difficult to find. I am definitely not looking for finescale, but might use some code 75 plain track along with my own inset track. The main feature of my layout will be the typical northern buildings, in HO, with HO sized bricks. MTI used to good for British HO. Unfortunately all my magazines are down in France, but when I go down there I plan to search through for something I can do for 3D printing. sample of austerity loco arrived today. It will not fit Fleischmann chassis, but the Electrotren/Hornby one might do OK. I will fix a couple of small errors in design, and make complete body available. I will keep the base flat so people can choose how to fit a chassis. One chassis which might suit is the old Triang TT Jinty chassis , rewheeled for 16.5mm gauge, I modified one many years ago for an idea using 16.5mm for Irish 5ft 3in, but did not finish chassis. Another possible chassis is the Heljan 05 shunter , but can't find a picture of inside. I have modified body based on what I had to cut away. Model now available. Excellent news! One duly ordered. I am planning on using a different chassis than the Bachmann 03, I think a Branchlines 04 chassis should fit, with a suitable motor & gearbox I should be able to have a cab clear of motor. Don't anyone hold your breath, my British HO is a long term project so don't expect much progress, but at least the availability of this model allows me to make a start. Thanks for making it available Simon. Just wondering how different the 04 chassis is. The wheels are certainly different and not like the austerity. When I was looking for info about the 03 chassis I found the instruction sheet on the Bachmann website and it still showed the upgraded Mainline type split chassis one.The sheet for the 04 is similar. My model as unboxed so I had no info with it. Reason I checked online was because I could not see where chassis unscrewed. Online did not help, so I looked for screws and found them under the couplings. I will be planning a small boxfile layout, using the lid as base so I can easily expand. I have row of buildings on hill in HO now, so enough to start.